While refrigerants are present in a number of common devices such as air conditioning systems and refrigerators, they need to be handled with care. Refrigerants are generally toxic and can cause a great deal of harm when they are not handled correctly. Fortunately, there are certain guidelines that can be followed when using and handling refrigerants which make them slightly safer. It is important that you know what these guidelines are and that you always follow them when you are handling and using these liquids. The first step to safely using and handling refrigerants will be to wear the correct protective clothing. You will need to ensure that you protect your eyes and any exposed skin which could come into contact with the refrigerant. To do this, you will need to wear gloves and goggles to protect yourself. You should also look at wearing clothing that is thicker than normal and will cover your arms and legs. This will ensure that you do not suffer from any potential burns should the refrigerant come into contact with your person. It is particularly important that you wear this protective clothing when you are charging or discharging any refrigerant from any systems in your home. While this might seem like a strange guideline, you need to read the instructions and product label that comes with the refrigerant. The Material Safety Data Sheet is particularly important and will have a lot of information that you need to know about. This information will tell you more about the correct handling of the specific refrigerant that you are going to be working with. The instructions and other information will also give you more details on the safety parameters required for the refrigerant. While there are certain guidelines that can be used for all refrigerants, there are others which are specific to the chemical makeup of the particular refrigerant you are using. This is particularly true if you are looking at fluorocarbon refrigerants. The system that you are placing the refrigerant from http://www.bluonenergy.com in will need to be considered when looking at safety guidelines. There are certain systems which can only handle certain types of refrigerants and you need to be aware of this. Placing the wrong refrigerant into a machine can cause a lot of problems and will be a major safety hazard. Using the wrong refrigerant will generally cause damage to the mechanisms within the machine you are working with. This will generally cause a complete breakdown of operation and other potentially dangerous situations. The way that the machine works will be related to the type of refrigerant you use as they will decompose at different rates as well as vaporize at different rates. If you are unsure about the compatibility of the refrigerant you are using, you need to look at the information provided by the machine manufacturer. Instruction and maintenance manuals will tell you about the refrigerant that the machine will be able to work with. You can also look at the product label of the refrigerant as this might have an indication of which machines it can be used in. When you are handling the refrigerant, you need to avoid exposure to heat. This could be radiated heat, direct sunlight, convection heat from appliances or an open flame. The reason for this is not the flammable nature of these liquids, but the chemicals which will result from the reaction to the heat. 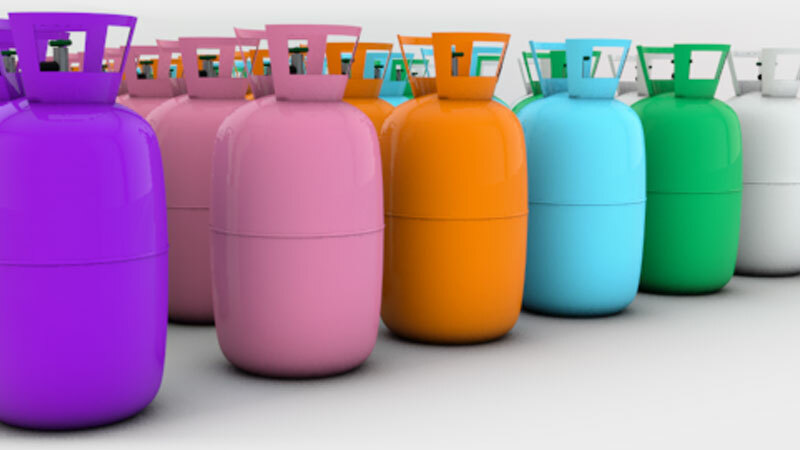 Depending on the chemical makeup of the refrigerant, heat can cause a number of different chemicals. These chemicals are the result of the reaction of the refrigerant to the heat and will generally be dangerous to people. The most common chemical to be created under these conditions will be hydrofluoric acid which can be very dangerous. If the refrigerant contained traced of chlorine in it, the heat reaction could cause hydrochloric acid to form. If there is a source of water or oxygen present when the heat reaction occurs, it is possible that a small amount of phosgene might be created. It is very easy to avoid the creation of these dangerous chemicals by simply keeping refrigerants away from any form or source of heat. When you work with refrigerants, you need to ensure that there is good ventilation in the area and a clear air flow. This is due to the fact that most of the fatal accidents which involve refrigerants occur when there is insufficient ventilation. When there is limited ventilation, oxygen deprivation can occur when you work with refrigerants. This is due to the fact that the vapors produced by refrigerants will generally be several times heavier than air. If there is no ventilation, the vapors will sit in the area and accumulate over time. This will cause an exclusion of oxygen which is needed for humans to survive. It is not only the lack of oxygen which is a potential hazard when working with refrigerants. The inhalation of concentrated refrigerant vapor is extremely dangerous and in some cases has been fatal. There are reported cases of fatal cardiac arrhythmia when people have been exposed to high levels of these vapors. The vapors can also cause skin and eye irritation. If you have inhaled refrigerant vapors, you will need to move to a well-ventilated area as soon as possible. The fresh air will help to counter the high levels of chemicals in the body and reduce the potential side effects. If you feel breathing is difficult after working with the refrigerant, you will need to seek medical attention as soon as possible as oxygen will generally need to be administered. There are many guidelines to safely use and handle refrigerants that you need to know about. These guidelines will include wearing protective clothing such as goggles and gloves. You also need to ensure that any working space is well ventilated and that you avoid any heat when working with the refrigerant.